The University of Mississippi School of Pharmacy will be globally recognized for its multidisciplinary research in the discovery, development and translation of innovative solutions to health care problems. The University of Mississippi School of Pharmacy is recognized as a major research institution. The school’s faculty members maintain active, funded research programs in a variety of biomedical, social administrative and clinical sciences. Faculty compete for funding from a variety of sources including the National Institutes of Health, other federal agencies, foundations and the pharmaceutical industry. The Research Institute of Pharmaceutical Sciences (RIPS) is a part of the school and was established in 1964 to discover and disseminate knowledge of natural drug products, develop and commercialize new products, improve public health, and stimulate the economy. RIPS currently comprises four centers: National Center for Natural Products Research, Center for Pharmaceutical Marketing and Management, Pii Center for Pharmaceutical Technology and the Center for Clinical and Translational Science, located on both the Oxford campus and at the University of Mississippi Medical Center in Jackson. As per the Fiscal Year 2016 Faculty Research Grant Institutional Rankings published by the American Association of Colleges of Pharmacy, the University of Mississippi School of Pharmacy was ranked 14th amongst all the colleges of pharmacy in terms of total extramural funding. The school also ranks amongst the top two schools/colleges within the university in terms of extramural funding. 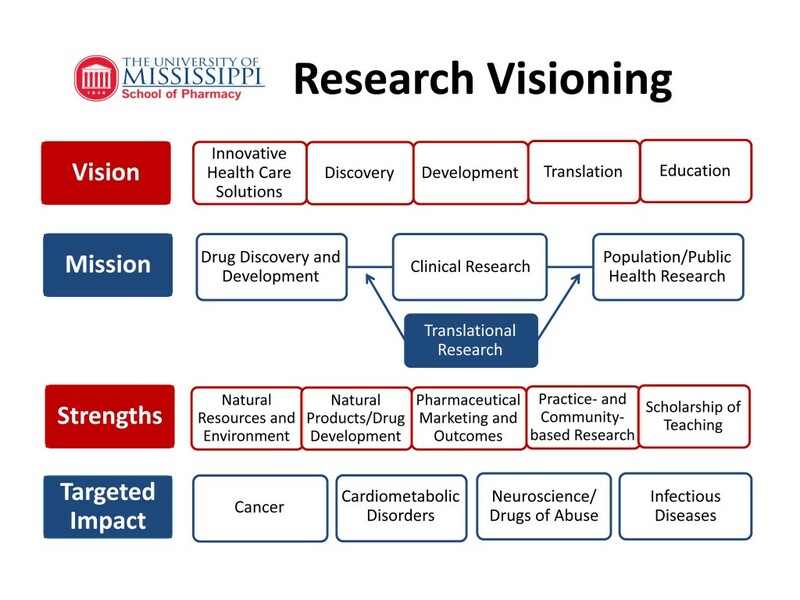 In 2012, the School of Pharmacy developed a Research Visioning Strategic Plan to streamline research focus and enhance collaboration within the school, as well as the broader university and its medical center in Jackson.